We’ll meet from 12.30 to 2 PM. Please come to room 305 of the hospitable Department of Psychology: 26 Bedford Way, WC1H 0AP (the same place as usual). Go to the seminar room on the 3rd floor. You can buy drinks and sandwiches at the Café next door to the seminar room , or bring your own! Step-free access is available immediately to the right of the main entrance. To carry on in our series “Who am I – what am I doing?”, our inspiring speaker is Helen Wilson. She’ll be telling us about herself, her career, her work on applied mathematics, as well as some interesting activities outside of UCL. 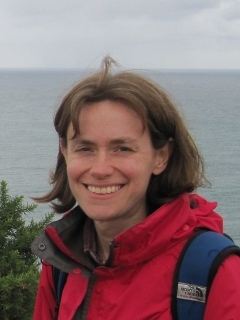 Helen Wilson is a mathematician on the very applied end of the discipline. She did her PhD in Applied Mathematics at Cambridge, and after one 2-year postdoc in Chemical Engineering at the University of Colorado, took her first lectureship. She taught at the University of Leeds for four years before moving to UCL in 2004. Since then she has been promoted to Reader and is currently the deputy head of the Mathematics department. She also serves on the A-Level Content Advisory Board for Mathematics, the Parliamentary and Scientific Committee and the Council of the Institute of Mathematics and its Applications. Her research focuses on complex fluids: those whose flow laws are not the usual Newtonian model satisfied by air, water and syrup. In particular, she has extensive experience of instability phenomena in elastic liquids (liquids which have some solid-like memory of their previous state, often due to dissolved macromolecules) and of the dynamics of viscous suspensions of solid particles. This entry was posted in Events, Who am I - what am I doing? and tagged Helen Wilson. Bookmark the permalink.